Wondering what to get for your hubby for your anniversary when you're on a budget? Here's what I did. It's a blanket made of shirts from the past five years of our marriage. The back is made from our first set of sheets as a married couple. To us it's just a giant memory to snuggle under. Each square is 10" by 10"
This square brings back the most memories to us since this is where we met. Refer back to Megan's baby rag quilt for instructions on how to put it together. The only difference between hers and mine is that mine is a lot bigger, it's is made of fabric squares on the top and fabric strips on the back, and I sewed around the edge of the blanket and snipped the edges rather than binding the edges. 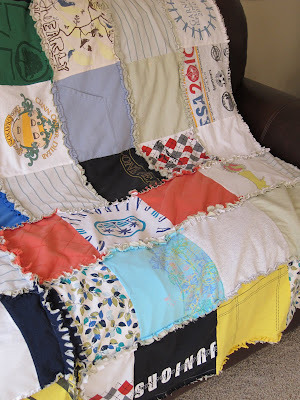 You can make this quilt any size. Just lay it out, step back and take a look, re-arrange, and sew the squares together in rows. Take note of how long the rows are. The back of the quilt was made up of strips of "sheet" fabric 10" wide by the length of the square rows. ( I think mine was 80") Layer the fabric like a sandwich starting with the sheet on the bottom, then any middle fabric if you desire (like flannel), and then the shirt row. At this point you can either sew down the center for more stability or just pin it for stability. 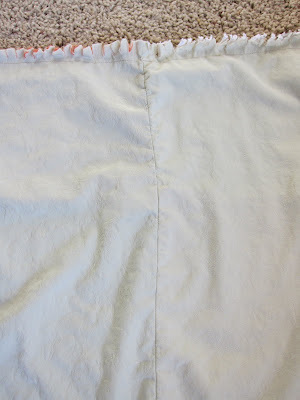 Sew the rows together so that you can snip or "fringe" the t-shirt side of the blanket. I love this idea! Thanks for sharing! I've only been married for 2 months but I will try this when we have more clothes behind us! What a beautiful and very romantic gift! I love it, and will remember it for the future! Such a wonderful idea... love it! What an excellent idea. 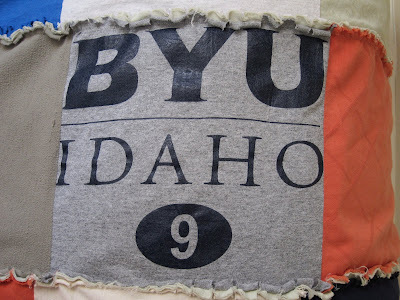 Come next October hubby & I will be married 37 yrs, and he has boo-coo t-shirts that he refuses to part with, so you just gave me this wonderful idea as to how I can save his shirts by re-using them in such a special way. And I have plenty of time to complete the project before our next anniversary.